5.1 Earthquake hits east of the Kuril Islands. Heavy unseasonal rains due to the presence of a trough that hovered from Madhya Pradesh to south Tamil Nadu across Rayalaseema and Telangana lashed various parts of the state and have left behind a trail of destruction. Almost all seasonal crops were damaged in the four North Coastal districts of the state. 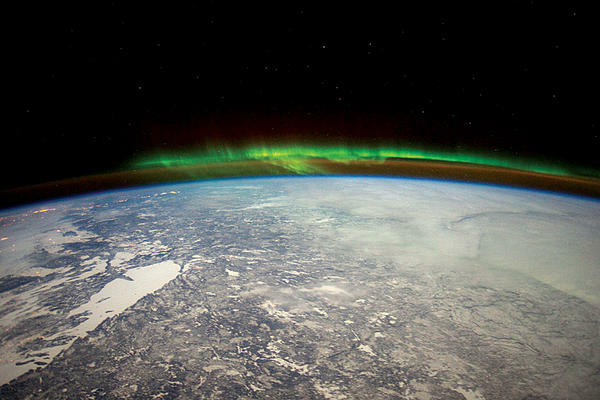 The aurora borealis appeared just north of a snow-covered Canada in this image taken from the International Space Station. 24 cases of Nipah virus infection have been reported in Bangladesh since the beginning of 2013, of which 21 cases have died. Nipah virus is an emerging zoonotic infection which causes encephalitis and respiratory illness in people. Germany has reported new cases of a low pathogenic bird flu virus at two turkey farms in the northwestern part of the country, the World Animal Health Organisation (OIE) said on Monday. German authorities reported to the OIE that 10 infected turkeys were found last week in Badbergen, Lower Saxony, leading to the culling of 7,920 animals. Stromboli (Eolian Islands, Italy): Magma stands high inside the conduits. A small overflow is occurring from the NE crater. The lava flow reaches about 100 meters length at the moment. Tremor and explosion signals are moderate to elevated. Shiveluch (Kamchatka): A possible explosion or partial lava dome collapse produced a modest ash plume yesterday rising to 12,000 ft (3.7 km) altitude (VAAC Tokyo). KVERT reports no significant changes and continues to record moderate tremor levels, indicating that magma continues to rise and slowly build up the lava dome. Tolbachik (Kamchatka): No changes were reported in the eruption. Lava flows continue to effuse from the southern fissure on Tolbachinsky Dol, and tremor levels remain stable (KVERT). Batu Tara (Sunda Islands, Indonesia): Strombolian activity continues. A stronger explosion yesterday produced an ash plume rising to 7,000 ft (2.1 km) altitude detected on satellite (VAAC Darwin). Soputan (North Sulawesi, Indonesia): Indonesian volcanologists raised the alert level to 3 out of 4 (“Siaga”, alert) on 19 April. The decision was based on an increase in block avalanches and seismicity including numerous volcanic-tectonic VA earthquakes (rock fracturing) and long-period VB events corresponding to internal fluid movements. Popocatépetl (Central Mexico): Activity has decreased to about one emission of gas/steam/minor amounts of ash per hour over the past few days. Glow remains visible at night from the crater. Santa María / Santiaguito (Guatemala): Explosions of moderate size have been observed producing ash plumes reaching up to 900 m height, and causing light ash fall in the areas of Finca El Rosario and near San Marcos Palajunoj. Strong degassing noises were sometimes heard and some avalanches occurred from the flows on the NE and S sides of the active lava dome. Pacaya (Guatemala): Weak strombolian activity continues from Mackenney crater, accompanied by visible incandescence at night. Fuego (Guatemala): An increase in strombolian activity has been observed. Explosions eject incandescent material to 100-150 m height and creates avalanches when falling back onto the slopes. Ash plumes from this activity have been rising 300-600 m.
Telica (Nicaragua): The seismic swarm continues with frequent, but smaller earthquakes compared to the previous week. Nevado del Ruiz (Colombia): The earthquakes swarm at depths between 5-9 km continues with increasingly strong quakes, and accompanied by continuous volcanic tremor (since 10 April), indicating an ongoing magmatic intrusion. Some of the recent earthquakes were above magnitude 4 and felt in areas near Manizales town. The volcano is now producing a plume of gas and ash rising to about 800 meters and light ash fall has occurred in various parts of Tolima.